The smell of popcorn is one of the world’s most enticing scents. Walk by a microwave that is popping corn and it is nearly impossible not to salivate. The folks at Pop Secret know that smell is an important part of the entire popcorn experience. 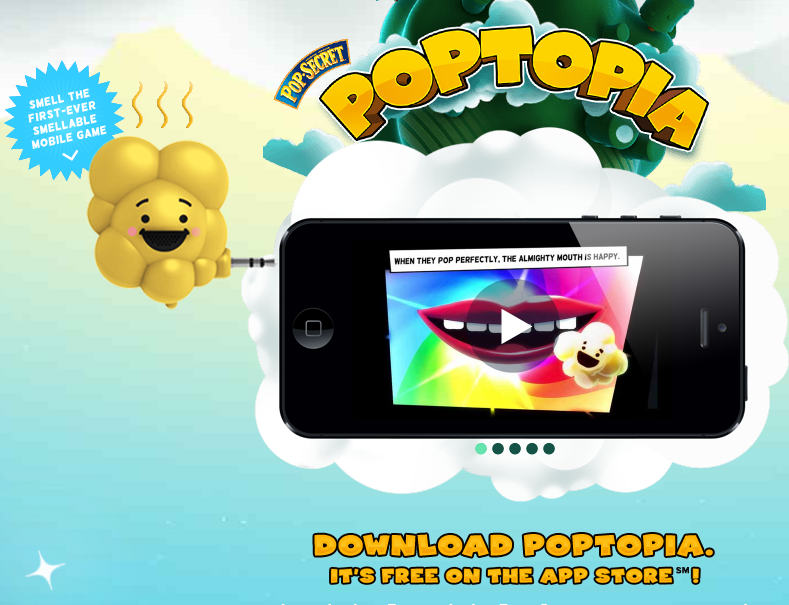 Pop Secret has recently launched a mobile phone attachment, called Pop Dongle, that gives consumers the sweet-and-salty smell of popcorn when they are playing the brand’s mobile game, Poptopia. Whenever a player swipes the butter inside the game 9which asks players to pop corn kernels), the Pop Dongle spritzes a scent of popcorn. It works by adding a device (dongle) into the audio jack of an iPhone or iPod Touch; the game uses a certain frequency signaling it to spread the smell of popcorn. Discuss the importance of demonstrating a product, including tasting and smelling: experiential marketing. The Poptopia app can be found on iTunes. Discuss the competitors to Pop Secret. Divide students into teams and have teach compare the competitors. How does this product create a point of difference? What other ways are there to create a point of difference for the company? Debrief the exercise by showing the students’ points on the white board.